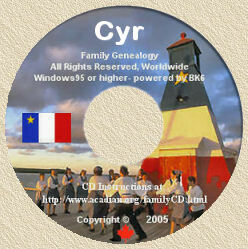 Acadian Genealogy Homepage; l'Évangeline newspaper! "History of l'Évangeline newspaper", published in 1997. Moncton, Chaire d'études acadiennes et Éditions d'Acadie, 1997, 416 p.
"The newspaper was one of the principal tools of development in Acadie", said Bernard Poirier, editor-in-chief of L'Évangeline, from 1957-67. The newspaper stopped printing in 1982, the victim of a chronic lack of money, the owners said. The idea for the history is Mr. Poirier's, although the history project will be piloted by the Chair of Acadian Studies at the University of Moncton. "In all fairness, we must render unto Caesar, what is Caesar's. L'Évangeline was an Acadian institution for 95 years and we wanted to do a history of its role before many of the principals disappeared," said Mr. Poirier. Gerard Beaulieu, a history professor at the U of M, is in charge of the project. Eighteen people, mostly from the University, have been assigned different chapters to write about L'Évangeline, covering the range from politics and arts, to the co-operative movement. "More than any other French-language paper (in New Brunswick), L'Évangeline gave itself the mandate of being the national paper for Acadians. Not only did it evolve, but it's also interesting to see how it provoked change and became a factor for change in Acadian society," said Mr. Beaulieu. The history professor said he was very surprised to find editorials from the 1930's, strongly supporting the unionization of woodcutters, "and denouncing their exploitation. That didn't go over very well in the conservative milieu of the time. It was very progressive." Mr. Beaulieu said the paper not only reflected Acadian society, but was a "privileged witness and actor in its [Acadie's] evolution. History demands that we try to understand that evolution." In his own opinion, L'Évangeline could have stayed opened. "It always had financial difficulties, but Acadians always came to its rescue." For two years after it shut down, Acadians had no daily newspaper in their own language. In 1984, "L'Acadie Nouvelle" began publishing as a regional daily, based on the Acadian Peninsula. In 1986, with the help of a $6-million trust fund from Ottawa and the province, "Le Matin" was published out of Moncton. But it failed and the fund was eventually transferred to "L'Acadie Nouvelle" to help it become the only provincial French-language daily in the province [of New Brunswick].